Turkish President Recep Tayyip Erdoğan told a rally of millions of people in Istanbul on Aug. 7 that he would approve the death penalty if parliament voted for it, following last month's failed coup. Erdoğan started his speech at the "Democracy and Martyrs' Rally” against the July 15 coup attempt by thanking the people who stood against the tanks and planes used by the coup plotters. He wished his condolences to the 240 people killed by coup soldiers, of whom 172 were civilians, 63 were police officers and five were soldiers. He also wished speedy recovery to the 2,195 wounded. During Erdoğan’s speech the crowd repeatedly shouted that they wanted death penalty to be reintroduced. “If the people want death penalty, I think the political parties will also accept it,” he also said, as he noted that the death penalty existed until 1984 in Turkey. Russian President Vladimir Putin said Russian trade sanctions on Turkey would be phased out "step by step". "The priority is to get back to the pre-crisis level of co-operation," he told Turkish President Recep Tayyip Erdogan in St Petersburg. Their relations soured last November when Turkey shot down a Russian bomber on the Syrian border. It is Mr Erdogan's first foreign visit since an attempted coup last month. He has since launched a far-reaching purge of the armed forces and other state institutions. Speaking in St Petersburg Mr Erdogan thanked Mr Putin, saying a call from the Russian leader after the coup "meant a lot psychologically". He said "the Moscow-Ankara friendship axis will be restored"
My, my, what a quick change of tone we have seen from Erdogan. Turkey's time in NATO is likely very limited, EU talks completely out the window. I think this is the start of a major restructuring of alliances. Disgruntled NATO or EU members will begin to shift towards Russia (who may not exactly like these countries, but as long as it damages the US' influence, it's cool), and we could see new alliances being formed. Turkish police searched the offices of a nationwide retail chain and a healthcare and technology company on Tuesday, arresting dozens of people in some of the biggest raids on private businesses since last month's failed coup. Around half of those detained have been placed under formal arrest and tens of thousands more have been suspended in the military, police and civil service. The breadth of the probe has worried the West, which fears President Tayyip Erdogan is using it to quash dissent. Now, how about handing over the Straits to us? Appears her attempts to appease Erdogan have backfired spectacularly against her. Since he continues to try to abuse the German court system to silence his German detractors. The two main parties would now fail to win more than half the vote and it looks like the AfD could soon be the country's second largest political party. At this rate I think Merkel's party is going to try to get rid of her before long. You'd think a German chancellor would know better than to appease a fascist dictator. Question--didn't Erdogan and the E.U. sign an agreement for Turkey to halt the spread of Syrian refugees to Europe? The TurkeyBlocks monitoring network has detected restrictions on access to multiple social media services Facebook, Twitter and YouTube throughout Turkey beginning Friday Nov 04 2016 1:20AM local time, ongoing as of Friday noon. A former NSA employee has accused Donald Trump’s selection for National Security Advisor of taking money from both Russia and Turkey and of breaching information security regulations. 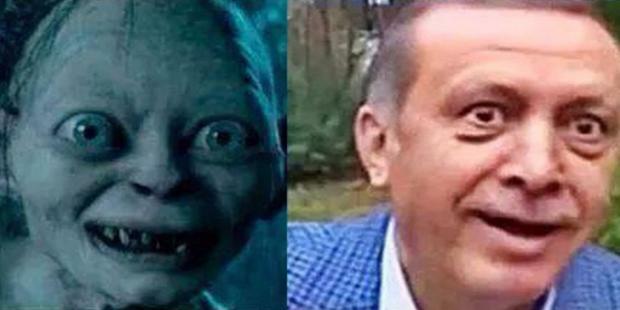 ...so, perhaps mr. Erdogan lost his nerve. Oh joys, it was true! Turkey invaded Syria last month. Turkey's ruling Justice and Development Party (AK Party) has submitted to parliament a bill granting extended powers to the presidency and abolishing the prime ministry, among other major changes. The 21-article constitutional change, if adopted, would take Turkey away from its current parliamentary system, and introduce an executive presidency, a move that worries critics of President Recep Tayyip Erdogan. Saturday's proposed constitutional changes are expected to be discussed at the relevant parliamentary commission first, before the bill is brought to a parliamentary hearing and, if passed there, put to a referendum. Government officials have pointed at the spring of 2017 for a possible referendum. Erdogan became Turkey's first president to be elected by popular vote in 2014, after serving three terms as prime minister. He said numerous times that the popular vote had transformed his presidency compared to the past presidencies, which were seen as largely ceremonial. Theresa May and Turkish president Recep Tayyip Erdoğan have signed a £100m commitment to build new fighter jets, in a deal Downing Street hopes will see Britain become Turkey’s leading defence partner. Despite concerns about Erdoğan’s human rights record and the increasingly authoritarian tone of his government, which has locked up thousands of political dissidents and protestors, a Downing Street spokeswoman said the two issues – human rights and trade – were distinct. Is this a joke? This has to be a joke, right? 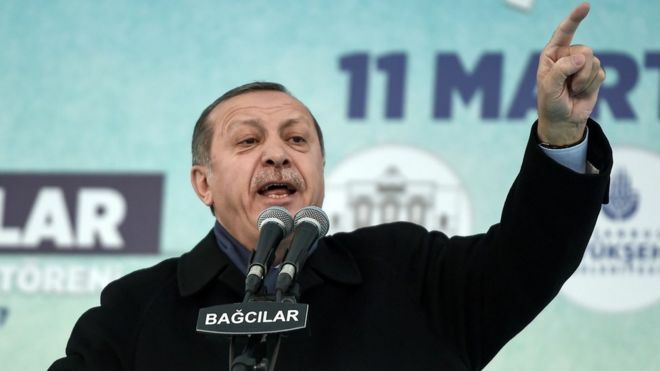 Turkish President Recep Tayyip Erdogan has described the Dutch as "Nazi remnants and fascists", as a diplomatic row grows over a cancelled rally. The Turkish foreign minister was due to speak in the Dutch city of Rotterdam on Saturday in support of a referendum to give Mr Erdogan greater powers. But the rally was banned for security reasons, and the minister's plane was then refused permission to land. Turkey has now summoned the Dutch charge d'affaires for an explanation. The Turkish cabinet was on Monday expected to consider imposing sanctions on the Netherlands in a deepening row with its NATO ally over a ban on its ministers speaking at political events in Rotterdam, and one minister said punitive measures were likely. President Tayyip Erdogan, who is seeking support from Turks in a referendum on boosting his powers, has accused the Dutch government of acting like "Nazi remnants" and said it should face sanctions for barring his ministers from addressing expatriate Turks to drum up votes. The row marks another low point in relations between Turkey and Europe, further dimming Ankara's prospects of joining the bloc. It also comes as Turkey is caught up by security concerns over militant attacks and the war in neighboring Syria. A source close to the government told Reuters that sanctions were expected to be discussed when ministers meet at 7 pm (1600 GMT). Ankara's minister for EU Affairs, Omer Celik, said sanctions were likely. "We will surely have sanctions against the latest actions by the Netherlands. We will answer them with these," Celik said. The series of terrorist attacks that have struck Turkey over the last year are sending the country — once viewed as a democratic, secular model for the Middle East — into a death spiral at the very moment when its people are to vote on a new constitution next month. Tourism — which had accounted for more than 10 percent of Turkey’s GDP — is withering, and foreign direct investment is set to slow considerably. These outcomes will reinforce each other, producing a vicious cycle that will be difficult to halt. Turkey’s government-controlled media and large swaths of the population see the nefarious hand of the West in the country’s unraveling. Observers often blame Turkey’s deepening plight on its inability to reconcile traditional Islam and modernizing Western tendencies, as well as on external events, such as the conflict in Syria. But decisions by Turkish President Recep Tayyip Erdogan have also contributed to Turkey’s vulnerability to terrorism. Turkey’s quarrel with Europe worsened over the weekend after the Turkish president accused the Dutch government of Nazism, and Turkish politicians were barred or disinvited from events in two European countries, amid tensions ahead of a tight referendum on a new Turkish Constitution. Having criticized German officials for barring their Turkish counterparts from campaign events this month, President Recep Tayyip Erdogan turned his ire on the Netherlands after the Dutch stopped the Turkish foreign minister from landing there for a rally on Saturday, and then escorted the Turkish family minister out of the country early on Sunday, citing risks to public order and security. It was an unusually strong reaction from the Dutch, who have generally taken an open stance toward diverse points of view, but who are in the midst of an election campaign in which immigration and integration are major topics. One good thing came from this though. What Erdogan tried to do was so preposterous, that for once every Dutch politician left or right winged agreed that it was stupid. We're in the middle of elections here. Erdogan tried to send one of his ministers over to start a campaign to have Turks support him from here. The first problem is that it perpetuates the general image that these people are Turks - not Dutch citizens. That's in conflict with running a multicultural society. The second problem is the complete lack of common courtesy in all this. It's like barging into someone's home at the moment there's a family quarrel going on, and tell people there to instead busy themselves with you. If we'd pull a stunt like that with Turkey, not only would I feel rightfully ashamed (get a hint rioters), Erdogan would likely do much worse than simply sending them back. Turkey in many ways is the guide book to what the republicans want for America. -Religion in government and every day life! -Oppression to the opposition or anyone that speaks against them. 17 states are working to make protesting harder in America. -Less help for the poor. Yep, America is also going down this path.